The Psychedelic Debut of Jimi Hendrix When Jimi Hendrix's debut album, Are You Experienced? was released in 1967, it turned the music world upside down. The ground-breaking psychedelic rock recording is a recent selection for the National Recording Registry. "He was exciting to work with, my God, he was just -- I'd never seen or witnessed anything like that in my life..."
"Jimi's standards for what a vocalist is are really incredibly high..."
In the fourth of a five-part series produced by independent producer Ben Manilla and Media Mechanics, Weekend All Things Considered looks at recordings recently selected for the Library of Congress' prestigious honor. 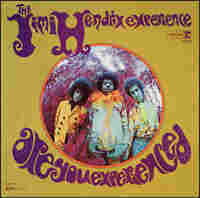 When Jimi Hendrix's debut album, Are You Experienced? was released in 1967, it turned the music world upside down. With its crackling feedback and ground-breaking guitar playing, Are You Experienced? fused the psychedelic sounds of the late '60s with the classic traditions of rock, blues and soul. Released first in the United Kingdom and a few months later in the United States, the album propelled Hendrix to international fame. Today Are You Experienced? is regarded as one of the greatest and most influential debut releases in rock and roll. "It's still a landmark recording because it is of the rock, R&B, blues... musical tradition," notes Smithsonian musicologist Reuben Jackson. "It altered the syntax of the music, if you will, in a way I compare to, say, James Joyce's Ulysses. You read a page or two of Ulysses and then you listen to just "Purple Haze," and you think, my goodness, what is this?" The recording introduced the world to the guitar virtuosity of Jimi Hendrix. A master at the instrument, he pioneered new techniques in distortion, echo and volume. "We were experimenting," says Eddie Kramer, the audio engineer for the album. "That was the exciting part. Whatever he did in the studio we had to just keep up and try to figure out how to record it in a halfway decent fashion." But musician Vernon Reid says that Hendrix's guitar skills have often obscured his other gifts: "I think Jimi's singing, I think his lyrics have often been given short shrift in consideration of his guitar playing, because his guitar playing is so overwhelmingly powerful. 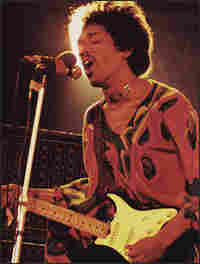 See, there was no dividing line in Hendrix between a song, the improvisation, the singing. It was all one thing."